Osi Kovacs was born in Hungary on the 3rd of December 1978. After graduating in economics and attaining a marketing communication degree, Orsi decided to move to England and commence her professional life in London. A few years later Orsi studied coaching, and in June 2012, Orsi became a qualified life & business coach. As Orsi has always been passionate about coaching people, helping them realise that even their worst fear can be overcome, in July 2015 she decided to leave her corporate career behind and follow her heart. Orsi was ready and determined to embark on her new adventure. 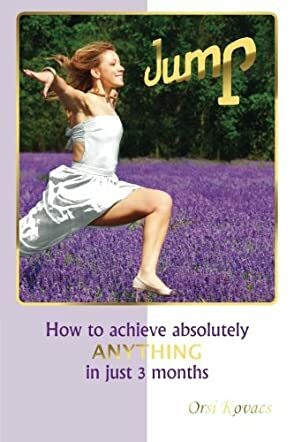 Orsi wrote a book, called JUMP – How to achieve absolutely ANYTHING in just 3 months that is now available on Amazon. Author Orsi Kovacs quit her job and penned the book Jump: How to Achieve Absolutely ANYTHING in Just 3 Months. This book allows the reader to follow the author's journey as she shares how she can achieve proper relationships, help others through coaching, discover new ways to create finances, health and fitness, as well as give to charities to help others. Author Kovacs encourages the reader to not only walk along with her but to experience their own ability to "jump" and achieve more within their life, to achieve what they are called and gifted to do. There may be moments of failures, of set-backs, as well as successes, but one can never succeed unless they "Jump" and take a chance to do more than they have previously done. The reader is taken along on this 90-day journey, allowing them to see the daily activities of the author. This enables the reader to see the pros and cons of what the author is writing about, and how fast one can literally achieve what they have been writing about. While some may feel this isn't possible to achieve, the author will give insight and wisdom into how it can be achieved and put into practice. This book is encouraging and insightful, allowing the reader to move along at their own pace yet able to see that it is possible to achieve incredible things in just three short months. Reading this book may be just the thing needed to give a reader the encouragement to "Jump."